More than 160 people gathered in Odessa, Ukraine for the dedication of a new seminary building and mission centre for the Synod of Evangelical Lutheran Churches of Ukraine. 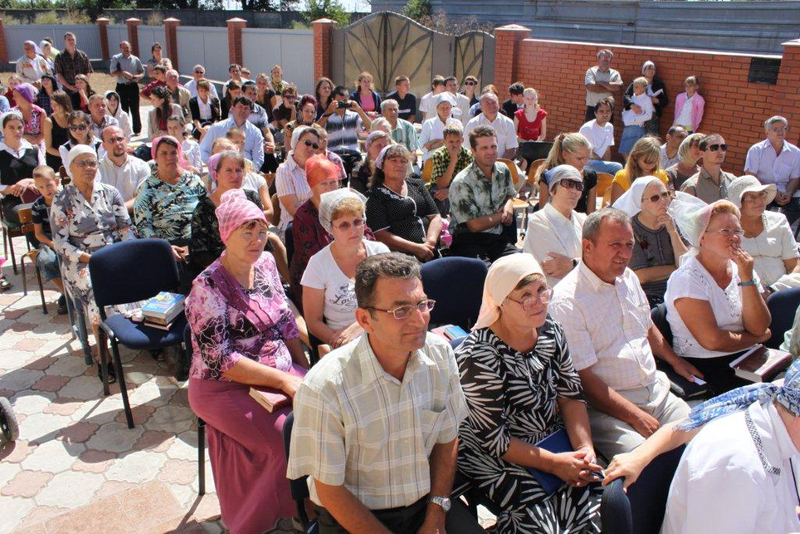 The sky was cloudless but the breeze off the Black Sea moderated the temperature in the shade as Lutheran Christians in Ukraine met to dedicate their spacious mission centre and seminary on the morning of Saturday, August 21. No room of the centre was large enough to contain the more than 160 worshippers, so the service of dedication was held outside in the courtyard surrounding the building’s main door. LCC missionary, Rev. 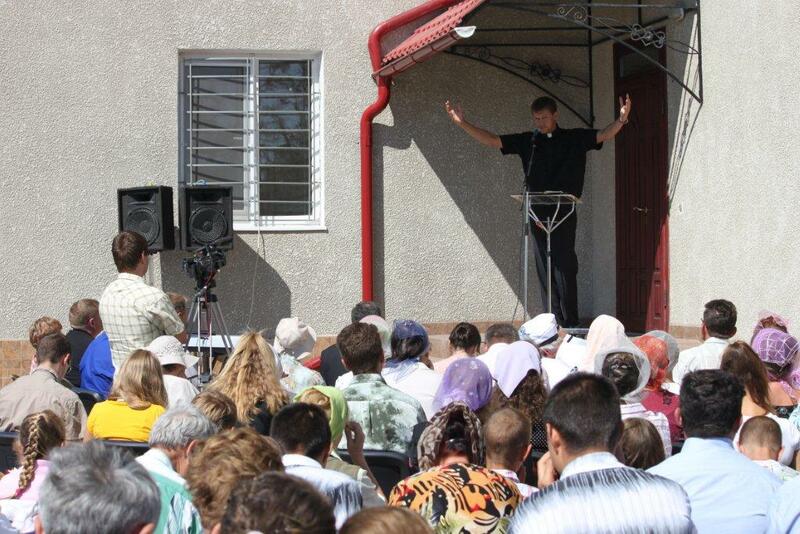 Alexey Navrotskiy preaches during the outdoor dedication service. Members of the Odessa congregation attended the event, but most of the worshippers had come from out-of-town during the previous days. They travelled by plane, train, bus and car; from Canada, Norway, Sweden, Germany, Kazakhstan and Moldova. But mainly they came from various congregation of the Synod of Evangelical Lutheran Churches of Ukraine to celebrate the dedication of the building which will become the focus and meeting place for their church in the years to come. Located in the village of Usatua, just west of Odessa, the centre was still lacking some things: permanent light fixtures, furniture, kitchen equipment, library resources among them. The top floor, which will one day contain the chapel and student commons area, is unfinished, but the first two floors were generally finished and ready for use. The two-hour service of dedication included sermons by Lutheran Church–Canada (LCC) President Dr. Robert Bugbee (This is the house of God and the gate of heaven) and LCC missionary Alexey Navrotskiy (On this rock I will build my church). After the morning service, the gathering received greetings from guests and enjoyed an outdoor meal. A second service followed at 5 p.m. which focused on the opening of the third academic session of the seminary. Professor Dr. Norman Threinen, who was also installed as the rektor of the seminary, preached on the temptations and joys of the ministry and SELCU Bishop Dr. Viktor Graefenstein, preached on Jeremiah 1: What do you see? The seminary and church have approved eight men to enter the seminary when it begins September 1. The students will stay in dormitory rooms except three students from Odessa. The men will be in residence for the successive six-week terms of the program which will extend over the normal school year. The building also houses an adequate kitchen and dining room. The bulk of the funds to build the mission centre and seminary have come from Canadian contributors through the Concordia Lutheran Mission Society an auxiliary organization of Lutheran Church–Canada. Rev. 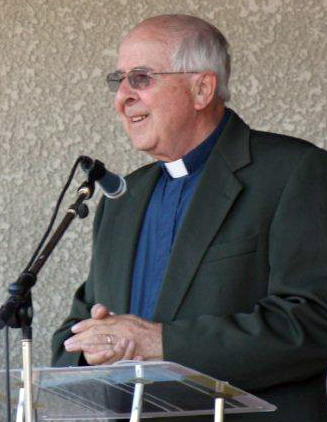 Dr. Norman J. Threinen is rektor of Concordia Seminary, Odessa and professor emeritus of Concordia Lutheran Seminary, Edmonton, Alberta.